Comments: Colorless unconsolidated hafnon grains, sample is from Speer and Cooper (1982). Location: Synthetic from Alex Speer. Scale: See Image. Comments: Black botryoidal to massive haggite in beige calcite with yellowish tyuyamunite. Location: Section 33 Mine, near Grants, Valencia County, New Mexico, USA. Scale: See Photo. Comments: Transparent, yellow crystals to 5 mm of haineaultite on matrix. Location: Mont St. Hilaire, Quebec, Canada. Scale: Picture size 1.5 cm. Comments: Minute divergent acicular crystals of white haiweeite on matrix. Location: Coso Uranium Mine, Inyo County, California, USA. Scale: See Photo. Comments: Pale yellow scaly metahaiweeite coating on quartz with minute haiweeite acicular crystals. Comments: Yellow, spherical, aggregates of acicular haiweeite with clear calcite scalenohedrons. Location: Teofilo Otoni, Minas Gerais, Brazil.. Scale: Picture size 1 cm. Comments: Secondary electron microscope (SEM) image showing tabular brochantite crystals growing on a featureless håleniusite-(La) substrate. (CanMin 42:1099). Location: Mine dumps of Bastnäs deposit, Skinnskatteberg District, Västmanland County, Sweden. Scale: Scale Bar 100 µ-m. 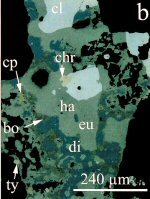 Comments: Back-scattered electron (BSE) micrograph of a section of bastnäsite-(La) showing partial alteration to håleniusite-(La), which is white on the image. Black areas are voids. (CanMin 42:1099). Comments: Hoppered pink halite crystals from the evaporation ponds. The pink color is due to the organism Halo bacterium that lives in the concentrated brine. Location: Searles Lake, Trona, San Bernadino County, California, USA. Scale: Crystal size 2 cm. Comments: Yellow scaly crusts of hallimondite. Location: Ellweiler, near Richenbach, Rheinland-Pfalz, Germany. Scale: See Photo. Location: Black Pine Mine, Philipsburg, Granite Co., Montana, USA. Scale: Crystal size 1-2 mm. Comments: Pale tan sectile porcelaneous massive halloysite. Location: Monroe County, Indiana, USA. Scale: See Photo. Location: Willi Agatz Mine, Dresden, Saxony, Germany. Scale: Picture size 4.5 cm.